It's almost a rule that anything French will be cool and effortlessly chic. 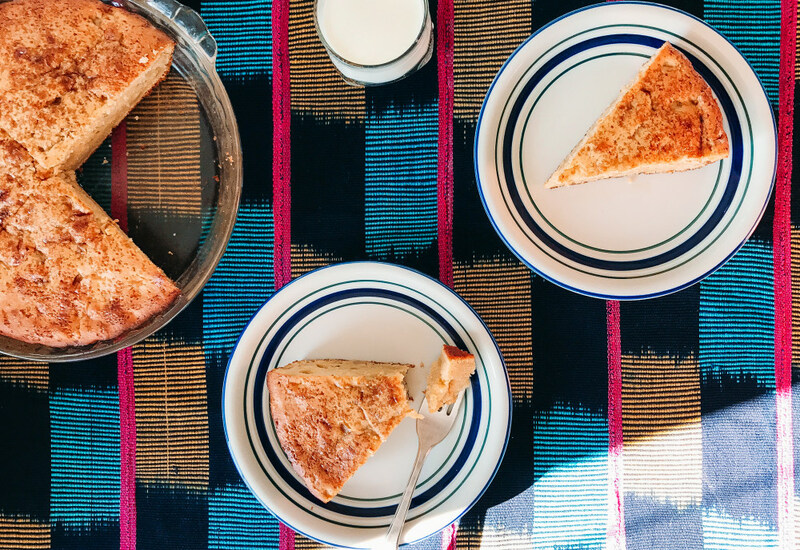 Well, this traditional apple yogurt cake is no exception. Maybe it's from the yogurt and olive oil, which make the cake super moist. Or maybe it's the orange blossom water, rum, and almond flour, which give it a certain je ne sais quoi. Whatever it is, this cake has it going on. Serve it as a light dessert with softly whipped cream. The cake's not too sweet so it's also perfect with a cuppa in the morning or for snacking on anytime of day. If you're looking to switch it up, try chopped pears or in-season berries in this cake. Or take it to the next level and sub in ground hazelnuts for the almond meal for an even richer flavor and color. Per Serving: 378 calories; 18g fat; 47.1g carbohydrates; 8g protein; 77mg cholesterol; 323mg sodium. Delicious apple yogurt cake that's perfectly sweet. Reminds me of an apple pie, but in cake form. My wife especially loves to eat it in the morning with a cup of coffee. This cake was delicious! I love incorporating yogurt, it gave it a nice moist texture and great taste. I don't eat baked goods often, but next time I do, I'll be making this again.